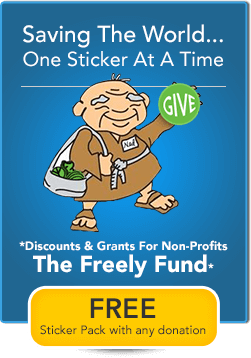 This year our company, Freely Creative/Websticker celebrates its 25th year of business success specializing in sticker marketing, creating high-impact promotional stickers, and developing profitable sticker products for organizations and businesses nationwide. 1) Understand Your Market. Better Yet, Create It. 25 years ago we were the only company touting stickers as a promotional marketing tool. Our competitors were jobbers – you sent them art and they printed it. We were different. 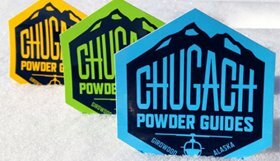 We knew that for the sticker to have the maximum marketing impact it needed to be the right size, designed well for its purpose and printed with long lasting inks and materials. For example: one of our customers used to order 10,000 stickers a year using a “jobber type company”, after we redesigned and upgraded the printing quality, they realized the true marketing potential of this well-designed, low-cost, high-exposure marketing tool and increased their yearly order with us to 100,000. 25 years later we are still their “go to” and they order a lot more than just that one sticker design. Differentiate yourself within your market! 2) Be a Leader, Innovate and Be Ahead of The Curve. Anticipate change and go after opportunities before your competitors. Anticipate the next marketing trend and customer needs and position yourself to be there first. At a recent company retreat we reviewed our 25 year company history. We were always ahead of the competition. 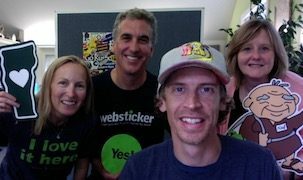 Not only were we one of the first companies to focus exclusively on sticker design and production, as the Internet became essential for businesses we were already there. We held top positions for many keywords on the first page of the search engines for many years. Now, as marketing and advertising shifts to more relationship based models like word-of-mouth, here we are offering the perfect low-cost tool for strengthening those connections and bonds. The key is to focus on the unique thing you do well and pay close attention to other innovative businesses and the emerging trends in technology, marketing and your specific industry. — and then stick with it. Don’t be everything to everyone. Then effectively communicate who you are to your employees and your customers. This isn’t a static exercise, things change – you will need to revisit, adjust, test and at times completely revamp your image, offerings, plans and communication techniques. 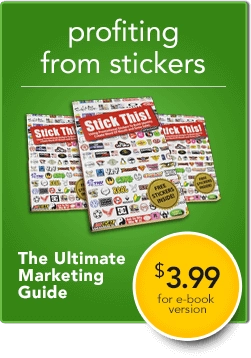 Jeff’s work experience, blogging, listening to success stories and studying design and other marketing methods has culminated in the writing of first book ever examining stickers as a marketing tool, “Stick This! 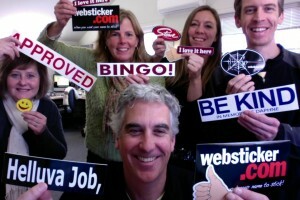 Using Promotional Stickers to Build Identity, Create Word-of-Mouth and Grow Sales”. Even if by default, this certainly makes him an expert in this particular niche. Through blogging, writing special reports and articles, speaking, authoring books and general networking anyone can become a perceived expert in their field. Study, network, read, write, share opinions, help others succeed… and, eventually you can become the ‘go to’ guy (or girl) to contact with questions and entrust with their business. Create a solid plan for each stage of growth. After diving in year one we since have engaged in planning in five-year increments. But, more recently, everything is changing so fast we now project three years out. Follow and adjust your plan but don’t be stalled, jump in, don’t be afraid to take risk. The reason most businesses fail is lack of capital to get through the formative years. Guilty! Without the business plan Jeff and Karen were not prepared for it to take two years to be profitable. With youth in their favor, they both worked evenings and weekends in restaurants to keep afloat. They worked really hard then (two jobs) and still work hard today (one job) but it’s rewarding. It is important to fund your start-up properly so that your business has the chance to get legs and succeed. In the early years Jeff & Karen joined business groups, attended seminars and read everything they could to improve the business. Today, they still do the same. Attend online and in person seminars, go to trade shows, invest in professional development for yourself and your employees. Keep current. Sometimes what you learn is just reaffirming that you are on the right track. And, learn from mistakes as there will be plenty of them. This has been a core value of our business since its foundation. With a 5 star customer rating and a very high rate of repeat business we have been able to successfully weather tough economic times and an explosion of competition. How? Over time we have built relationships and a reputation for outstanding products and service. The daily investment into customer service will reward your business over the long term. “Since I joined the company, it has been all about building relationships,” says Chris. DeRienzo. The quality of our stickers is far superior to many of our (lower priced) competitors. When competition became fierce, we did not hop on the inexpensive, low-quality sticker bandwagon with 100% automated service. We vowed to continue to only offer high quality screen printed and digital stickers with our tried and true personalized service. Why? Because that’s what we stand for… that’s our niche. Our customers want a product that represents them professionally and they want to work with real people to help them succeed, not trust a computer or unknown people to which they have no relationship at all. Surround yourself with a topnotch team and then create an environment to make them happy to work for you. Our employees work here for years enjoying good benefits and a healthy, rewarding, respectful work atmosphere. But, the stellar team doesn’t stop there. We work only with outstanding suppliers who share similar values and we treat them with the same respect as our employees. We are truly honored to have received the Award of Excellence from our main supplier for over 16 years. There will be rainy days that are out of your control, like in year five when our office burned to the ground or fifteen years into the business when the economy tanked. Be prepared for tough times with a cushion in the bank account. We’ve foregone raises some years but we’ve always been able to pay our employees and our suppliers which, in turn, nurtures the team! !